Fishing Line STROFT GTP Type R: Type R is our traditional GTP line available in the strengths Type 1 – Type 12. The R stands for round and tight. Last year this series was enhanced by the types R01 to R06. These are extremely fine lines that are available in diameters of approx between 0.07 mm and 0.13 mm that have breaking strains of between 1.5 kg and 4.0 kg. Up until now it wasn’t possible to manufacture such fine lines as the fibres were too thick, resulting in insufficient braids. A new, finer UHMWPEfibre has made it possible to produce these lines. However, it’s not possible to mass-produce them at the moment, due to the low demand. So we are happy to present the new lines, but at the same time must point out that only small quantities are available at the moment. Type R is produced with a very special braiding process. 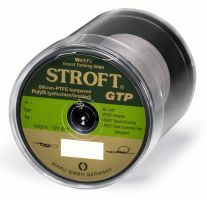 The STROFT specialbraid, for example, consists out 300x8 = 2400 single fibres in Type R12. This results in a practically perfect circular cross section, with arrow head “dimples” on the surface. The "dimples" produce tiny air turbulences during casting which greatly reduce air-resistance and increase casting distance. They work in a similar fashion to the dimples on a golf ball. Available in colours: light grey, green, orange, light blue, darkbrown, pink fluorescent and multicolor. With the line "multicolor", the colour changes exactly every 10m.